The cavernous sinus and Meckel’s cave have traditionally been considered some of the most difficult areas to access surgically. With the advent of endoscopic and minimally invasive approaches, medial-to-lateral and anterior-to-posterior surgical corridors are added to the surgeon’s armamentarium. Although extensive literature exists discussing the relevant surgical anatomy and surgical approaches from a lateral/open perspective, the experience with endonasal approaches is still growing. 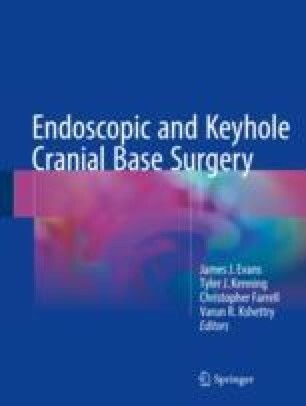 In this chapter, we analyze our criteria when selecting the endonasal approach for pathology involving the cavernous sinus and Meckel’s cave, examine the intricate surgical anatomy of these areas focusing on the endonasal perspective, and provide relevant surgical pearls based on our experience. Furthermore, we discuss our operative setup and instrumentation, as well as postoperative care and complications.